Dave Kerzner is back! Static is his second full-length solo album. New World established his prog bona fides, with its sprawling sci-fi concept album deployment of Pink Floyd-esque music. On Static, Dave again deploys his uncanny ability to sound like David Gilmour, and there are even moments when he sounds like Roger Waters shrieking away. But even though it’s easy to imagine if Pink Floyd were still making great albums today they would sound exactly like this, the amazing thing is that Dave is not a copycat. Although he has mastered vintage sounds — not just our favorite vocal stylings, but also the coolest keyboard sounds you will ever hear — he is not a purveyor of prog nostalgia. 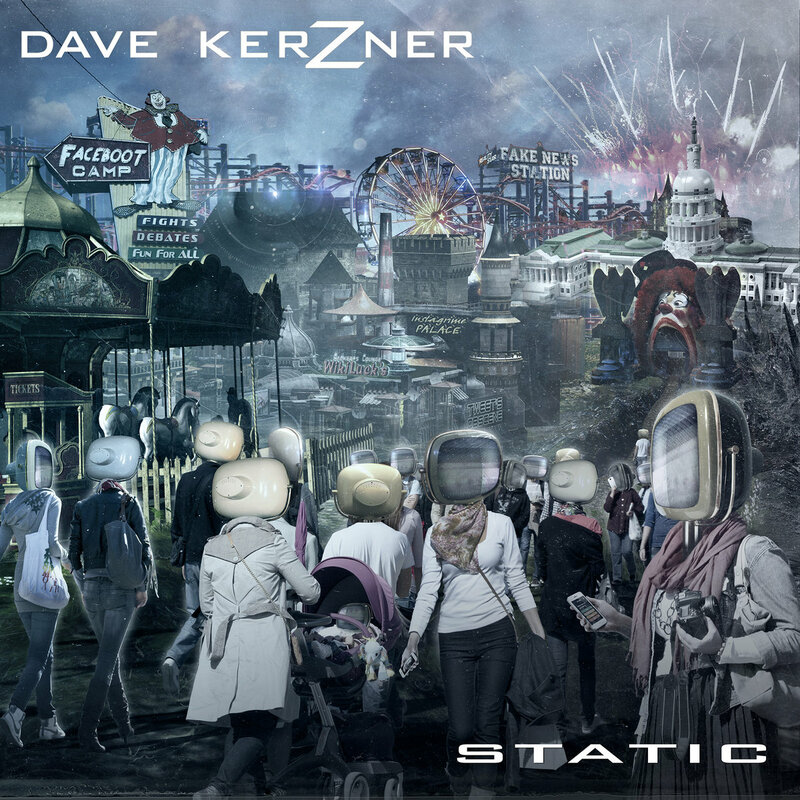 The most remarkable thing about Kerzner’s impressive new album, Static, is Dave’s songwriting abilities. He has every detail perfected: melody, harmony, orchestration, developmental dynamics, and emotional impact. His excellent songs are truly a cut above the competition and they unmistakably show how true musical talent, shaped by all the best musical influences, can be put in the service of stunning original compositions. Above all, the song is the thing of note here. Every track is outstanding, although the album really should be considered to be a ten-track opus. “Prelude” is nothing but a wispy introduction to the magnificent album-opening progfest, “Hypocrites,” which introduces a theme that will return at the end of the disc on the epic 16:52 finale, “The Carnival of Modern Life.” And “Quiet Storm” blends nicely into the rip-roaring “Dirty Soap Box,” where Steve Hackett and Nick D’Virgilio show up to set things ablaze. I also think that “Right Back to the Start” and “Statistic” are brief enough that they may be taken as two preludes joined to set up the superfunky “Millennium Man.” But however you do the math, whether ten or fourteen, the result is the same: the album is perfect prog pleasure, with incredible variety and richness. Dave’s quieter piano ballads (like “Static” or “Trust”) best display the subtle charms of his sophisticated songwriting skills. And they don’t really deserve to be called “piano ballads,” because they never stay still in one genre for long, but rather slowly soar into another musical dimension. So much surprise and delight is offered by this album, I can’t recommend it highly enough. Trust me, you have many, many hours of listening pleasure ahead. It’s hard to pick any track as a favorite, because they are all so good. But early loves of mine (in addition to the epic bookends of the album opener and closer) include “Reckless,” which has a jaw-dropping instrumental section that sounds like 1980s King Crimson, and “Chain Reaction,” which sounds to my ears like 100% Fun-era Matthew Sweet. As the Cadogan Crow flies..
Agreed-outstanding from start to finish. Retro/not retro. Excellent review.